Transformations, our focus for MDNY 2019, explores drawings depicting narratives that hold emotional weight, in which transformation hangs in the balance. The exhibit also illustrates ways we have been transformed through a commitment to fuller understanding of works in our keeping. Such understanding can only be brought about through the grace of interactions with those committed to the evolving discipline of Art History. We cannot stress enough our appreciation for, and admiration of, these professionals who go about their work day-by-day, without a lot of fanfare, in museums, institutions of higher learning, and art galleries. Through our correspondence with them we are given new eyes and a better understanding of history. Consequently, our lives are transformed! We dedicate this exhibition to them, and we’re grateful to those quoted below for the privilege of publishing their words and observations. Our move from Lois Wagner Fine Arts to the Kraushaar Galleries affords an unusual opportunity to see how works are transformed by the space in which they hang. Finally, we have given thought to how various works are transformed as viewed over time through the filter of the personal emotional landscape of the moment. Life is change. Those visiting us can expect to see works by Bernardino Mei, Carlo Bononi, Paolo de Matteis, Aureliano Milani, Pietro Antonio Novelli, Ubaldo Gandolfi, Charles-Joseph Natoire, Bernard Picart, as well as others not so fully understood. Below is a visual introduction to our exhibition. Look, and feel free to contact us for further information about size, medium, provenance, or price. This red chalk drawing by Natoire depicts The Apparition of the Virgin and Child Before St. Bernard by Luca Giordano, which hangs in the Church of the Holy Annunciation in Florence. Tradition has it that the Virgin appeared to St. Bernard to offer him encouragement when he felt too weak and ill to continue writing. Susanna Caviglia-Brunel has included this drawing in her catalog raisonee on Natoire (D84). Workshop of Veronese, with question of his hand, Compositional Study or Ricordo related to the Bottom Half of the Altar of St. George in Braida. The drawing illustrated above left, from the Pouncey/Stock archives, depicts St. George with a broken lance standing against the base of a column, looking up to a heavenly apparition—the virgin and child surrounded by angels making music as St. Georges helmet is borne aloft. 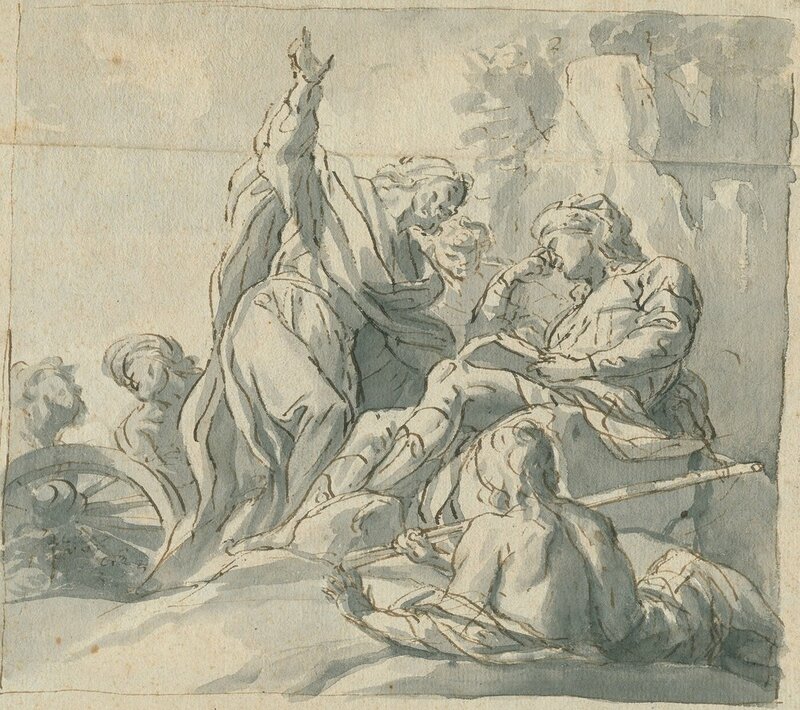 One finds a similar arrangement of saints in our drawing: St. Peter holding keys, St. Paul reading a book held by a young man, St. George, and a male and female figure looking on. The column is missing and a sketch of St. George slaying the dragon has been added bottom right. Tracking the evolution of ideas for the altarpiece is not easy. Richard Cocke has pointed out about our drawing that the “composition is a version of both the lost Coccina altar from San Zaccaria of 1565.” As mentioned before, the small sketch of St. George and the Princess seems to be an addition. Architectural details change. Such observations point to an element of experimentation to meet the requirements of the canons. Perhaps our drawing is not merely a copy, per se, but a never-executed invention comprised of ideas from several sources.